LV316 WWII honor roll on side of hardware building. LV317 WWII honor roll, Eugene Hawkins. LV322 Civil War veterans at courthouse in Baraboo. Photo by H.H. Bennett, from Shirley Springer. “Charles Pearson with patch on eye. (Was Charles Pearson Jr.’s grandfather). Main St., c. 1907. Loaned to copy by Ryan Rabuck. LV3 Duddleston Mill, 1908. Has been in the family since 1911. Joseph A. Duddleston 1911; sons, V.A. & L.D. Duddleston; grandson, Volney Duddleston & wife, Edna. LV4 Baseball team taken in front of drugstore. Charles Wilkinson, Bert Blank, Doc Barnett, George Borchers, Ben Paddock, Fred Klett, Ernie Marshall, Bill Hyslop, Ernie Richards, Vern Yanke, Vern Thompson. LV19 St. Paul=s church, Big Creek, located at what is now cemetery. LV23 Carrie Wilson home, first to have a phone in town. Line was run to Paddock=s store. LV30 Interior of hardware store? LV39 Passenger train passing through town. LV48 LaValle to Cazenovia, 1910-1935. The Chicago Northwestern and the Cazenovia Southern Railroads served LaValle. The CSRR was nicknamed APuckety Chute@. LV49 LaValle to Cazenovia on a converted Model-T which ran on railroad tracks, delivered mail. ca. early 1920's. LV50 Clara=s Store, Main St. Firehouse is located here in 2000. 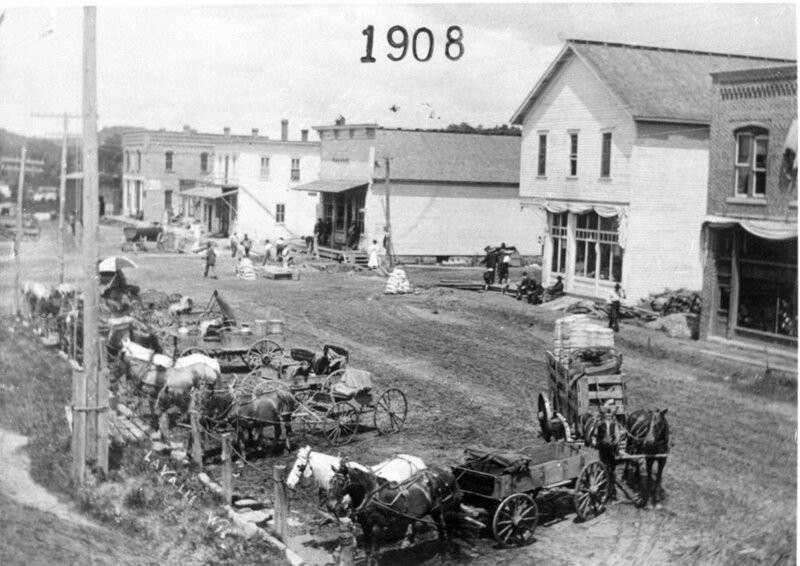 LV56 Main St. 1908. Fourth store on right is Paddock Grocery. LV58 Engelbretson Hotel/ Apker Rooming House, ca. 1885. Man in buggy, Philip J. Mihlbauer; L-R: on lower step, Ida Apker; Anna Sands Apker; Parker Apker; Clinton Apker; in white apron, Betsy Apker; Henry P. Apker; Mary Apker, Fritzgerald; James Fitzgerald, May Apker, Ed Apker. LV130 LaValle Bowling team, Eau Claire, WI, May 1, 1954. LaVerne Rabuck , Edith Hartje, middle, Dorothy Mlsna, Joan Rabuck, Jeanne Rudy. LV132 Deer hunters, ca. 1940. Doc Booher, Wally Henecke, Ed Greenwood, Glen Good, Ernie Richards. LV143 Oct. 1, 1894. Grace M. Paddak, Nov. 30, 1889; Benjamin E. Paddak. LV146 Katherine Paddock (Great grandmother), Grace Paddock Greenhalgh, Katherine Butterfield Hagerty & her two sons. LV153 Clayton & Harold Bray? LV163 Mrs. Katherine Paddock, Grace Paddock Greenhalgh, Katherine Butterfield Hagerty, Baby? LV168 John Coughlin, Pate Hamphel? LV180 Grandmother Ives. Mrs. Harriet Ives Paddock=s mother, lived in Clinton, N.Y.
LV189 Burt Blank Drug Store. Kid is Toby Funnel. Is part of the bank in 2000. LV191 AInstitute Spring of 1897. (Arrow points to Mary Giblen on left, skipping one man, Edith Hulbert (Head). X marks under John Gagham. LV192 Edward B. Gardner in July 4th parade with pony & wagon. Grandpa Fletcher Gardner is leading pony. ca. 1916. LV193 LaValle Days parade 1990. LV194 R.L. Miller, Schroeders, Newluns, Carol Lewis, Apple houses. Street past ball park. LV196 On left is Jewel Doering=s Tavern; lean-to is Charlie Dehler=s Barber Shop where several local men learned the barber trade. Note streetlights. ca. 1920's. LV203 Georgetown Hotel (Kathleen Page Faivre was born here). LV205 Catherine Ewer Paddock & Herbert Paddock Sr.
LV206 Katherine Paddock, center; Grace Paddock Greenaugh, left; Katherine Greenaugh (Kay Haggerty), right. LV212 Isaac Walton League Team, July 31, 1927. LV218 Benny Dee, President of the bank. ca. 1970's. LV223 Old LaValle telephone office, ca. 1923. Larene Cannon seated. LV276 Obed on hay, Henry McWilliams on ground. LV279 Harvey McWilliams on grain binder, Robert McWilliams driving, Ruth Ann McWilliams standing. LV319 Marie Ellsesar Millinery, Main St., LaValle. Mrs. Jerome house. Hulda Hochmuth is second from left. LV321 Charles & Emeline Pearson, Louie, Harriet, Lee, Charles. Charles Sr. ran the mill, worked in postoffice, was in LaValle State Bank when it failed in 1930's. LV322 Civil War veterans at courthouse in Baraboo. Photo by H.H. Bennett, from Shirley Springer. ACharles Pearson with patch on eye. (Was Charles Pearson Jr.=s grandfather).